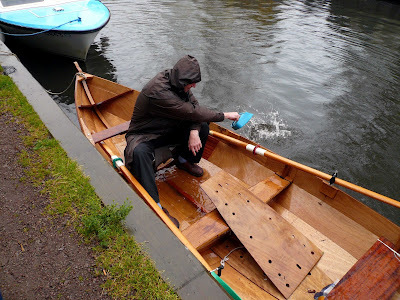 There is an EU Directive that mandates rain on British bank holidays, so on Sunday at the UK Home Built Boats Rally at Barton Broad it hissed down almost continuously. 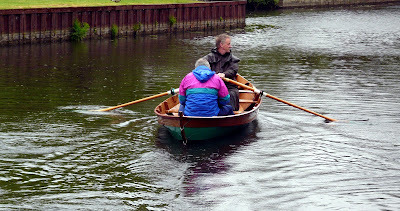 Our planned outing to the pub at Neatishead took place by car, except for the fearless Tony Waller and Chris Waite who rowed round in Tony's lovely double-ender Isabella III. b) he had cracked the mainmast sailing on the Broad the day before. After essential bailing he set off on the voyage back with Chris in the stern steering by voice (the rudder had been left behind).